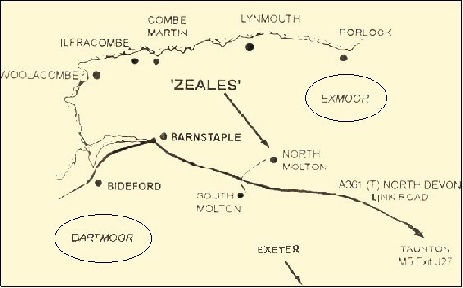 ZEALES is situated about 4 miles from the market town of South Molton. Most people arrive via the M5 and A361 (North Devon Link Road), the following directions assume this route. Leave the M5 at Junction 27 and take the A361 North Devon Link road in the direction of Barnstaple. Continue for approx. 20 miles. There is a roundabout signed South Molton. IGNORE THIS. About 2 miles further there is a staggered crossroads with North Molton to the right. Take this right turn right and follow the road to North Molton village. (Note – speed camera on the downhill approach to this junction). left and the Methodist Chapel on the right. Further down the hill the ‘Miner’s Arms’ is on the right. Continue down until the road widens out and ‘Zeales’ is the white house with the blue front door on the left just before two road signs indicating a humpback bridge and the road narrowing. The name of the house is on the apex of the porch. If you go over the bridge and cross the river you have gone too far!